Last week, President-elect Donald Trump tweeted he would hand control of his businesses to his sons before taking office. But he didn’t address his own role, something he had promised to discuss in a press conference last week. He put off that announcement until next month. Trump isn’t the first official to balance public office with family business. But critics say Trump’s vast network of personal and professional ties make separating the roles more complicated. And the government’s ethics office says Trump must divest to truly avoid conflict-with foreign entities, banks and a host of government agencies. A look at Trump and his businesses as he takes the White House. James Thurber Professor and director, Center for Congressional and Presidential Studies at American University; author of "Obama in Office: The First Two Years"; co-editor with Antoine Yoshinaka of "American Gridlock: The Sources, Character and Impact of Political Polarization"
MS. DIANE REHMThanks for joining us. I'm Diane Rehm. President-elect Donald Trump tweeted last week he would hand control of his businesses to his sons, Don and Eric, before he takes office. But he still has not addressed several concerns like the role of his daughter, Ivanka, his foreign ties and interests and possible ethics violations by his cabinet appointees. MS. DIANE REHMHere to talk about Trump's possible conflicts of interest as president, Darrel Samuelsohn, senior reporter at Politico, Jim Thurber, professor at American University and by phone from Santa Monica, Richard Painter, professor at the University of Minnesota Law School and chief White House ethics lawyer for George W. Bush. MS. DIANE REHMYou are, as always, invited to take part in our conversation. Give us a call, 800-433-8850. Send an email to drshow@wamu.org. Follow us on Facebook or send us a tweet. And thank you all for joining us. MR. JAMES THURBERGood to be here. MR. DARREN SAMUELSOHNThanks for having me. MR. RICHARD W. PAINTERThank you. REHMDarren, we were expecting this announcement from Donald Trump on the 15th of December about his businesses, what he was going to do. So what happened? SAMUELSOHNWell, everyone was looking forward to this. This was going to be his first press conference since winning the election, first one in a long time. Not since the summer, not since the Democratic National Convention week, has Donald Trump answered questions from the press. So a lot is building up, obviously not just around these issues, but his cabinet selections and the Russian hackings. They pushed this off, in large part, because they weren't ready. They didn't have all of their Is dotted and their Ts crossed. There are a lot of complicated matters in front of them, a lot of businesses all around the world that they need to unravel and untangle. SAMUELSOHNThere are a lot of big questions in terms of the tax consequences if he were to sell or give away parts of his business. He has these licensing agreements, which are probably the most important part of his business, having that name, that giant gold-plated name all across the many buildings around the world he has to make a decision on who owns that license and how to deal with contracts in very touch and go places like Azerbaijan, which we just learned he pulled back on on Friday on one of the deals with a hotel there. SAMUELSOHNSo a lot of questions. There are a lot of lawyers working through this. He's handing over the business, presumably, to his two adult sons, Eric and Donald Jr. The legal arrangement of how that works, how he communicates with them as a father and as the president when they are a part of his transition team, what happens with his daughter, Ivanka, who has a very large role also in the company and presumably looks like she's moving to Washington D.C. with her husband Jared Kushner who is looking to be getting a -- maybe not a job, but a senior advising role inside the White House in some shape or form, which we don't quite know about yet, which brings up nepotism laws as well. SAMUELSOHNSo a lot of legal, ethical and huge political challenges before then and that is, in large part, why they pushed this press conference off until after the new year. REHMJim Thurber, late last week, Trump tweeted "the media tries so hard to make my move to the White House, as it pertains to my business, so complex when actually it isn't." THURBERWell, it's very complex. Never in the history of the United States has a president elect presented more conflict of interest questions and foreign entanglements than Trump. Why? He has properties and companies in 111 nations -- pardon me, 111 properties in 18 nations and territories, including Saudi Arabia, Russia, Bahrain, Indonesia, India, Turkey. I was in Azerbaijan, Baku just before the election giving a lecture about how Hillary was going to win. Obviously, it wasn't quoted here. And there was a big building there that said, "Trump," on top of it. It was a hotel. THURBERAnd it had not opened because there was a conflict between the leader and a relative that built it without his permission. The embassy emailed me shortly after the election and they said, they decided to open the hotel. And then, as of -- quietly, on Friday, they have an agreement that that hotel will not be a Trump hotel, a Trump property and he's backed off of it, as he has in other nations throughout the world. But he still has loans from Deutsche Bank, that's investigated. But this is the absolute terrible thing. THURBERGSA has a provision -- sorry if I'm taking this from you, that says that a person that is an official in the U.S. government may not lease property from the GSA and he is leasing property from the GSA two blocks from the White House with the Trump hotel. REHMOr was the U.S. Post Office. THURBERIt was the U.S. Post Office and now it's a hotel. And everybody's -- from Bahrain to Azerbaijan to Russia is booking rooms there, showing that they like this president. REHMAll right. Turning to you Richard Painter, Trump seems to recognize that he needs to at least hand over his businesses, but divestment is the recommendation of the government ethics office. So that's a big sticking point. Can you explain why? PAINTERWell, most of the conflicts of interest come from his ownership of the businesses, regardless of who's managing them. If he owns the businesses, he has the conflicts because he benefits from the business' success. So while there is a lot of complexity here, I really with that he had assured us and assured the electors who are meeting today that there would be no foreign government payment coming into any businesses that he owns, that he still owns on January 20. That is unconstitutional. He simply cannot do it. And I wish he'd given us that assurance and he still should so that the electors, in good conscience, can vote for him to be president. REHMAll right. So Richard Painter, you say if he does not do as you suggest, it is unconstitutional. Where does that leave him? PAINTERWell, he -- what he has to do is, by January 20, not receive any foreign government payments and that would be a very bad situation if he were, as of January 20. And I think he'll figure out a way not to, by January 20. I just wish he'd given us the assurance, he'd given the electors the assurance now that he's going to do that. So that's absolutely critical. Foreign government payments have to be out when he's president or he's in violation of the Constitution. PAINTERHe also, though, needs to get this name off of buildings around the world in places where it could be a danger to the people living or working in the buildings. You know, you don't put the name of the president of the United States up on a building in a part of the world where it may difficult to protect it. Foreign governments paying to protect those buildings would reintroduce the emoluments clause question because they would be subsidizing Trump operations. So he needs to deal with that issue. And then, we need to figure out what Ivanka and Jared are going to do. PAINTERIf he's going to put -- appoint them in the White House, which might violate the anti-nepotism statute, he can go ahead and try and see what a court says. What I would be very upset to see going on is to have Ivanka and Jared or other family members exerting influence over the administration, but not having government jobs and then not, themselves, having to comply with the financial conflict of interest statutes and the disclosures rules. It's better to do it up front, appoint them, take a risk that a court will tell him that he can't under the anti-nepotism statute, but at least if they're in the government, they have to comply with the financial disclosure and the conflict of interest rules that apply to everybody else. PAINTERWe can't have yet more Trumps who are not following the laws that other people are required to in the government. So that needs to be clarified. REHMYeah. Now, Jim, isn't it even more difficult because we're not quite sure what this full web of ownership and limited partnerships and -- it just seems like a huge web. THURBERIt's not transparent as to what he owns and what he doesn't own, what he owes. He owes great amounts of money to Chinese banks, the Deutsche Bank, as I mentioned before. I think the only way out of it is to have a true real blind trust for the entire family. Now, every president has done this. Jimmy Carter sold his peanut farm. Barack Obama set up a blind trust and put all of his investments in free government bonds and index funds so, you know, what he did would influence maybe generally, but not specifically. THURBERGeorge W. Bush had a large stake in the Texas Rangers. He had to sell it. Now, this is the first president that has had so many businesses and so many complex things around the world, but he has to face it. He has to make up his mind. Is he going to represent the American people or his business? He's got to make the choice. SAMUELSOHNWell, it's interesting. Politically, Donald Trump won the presidency in large part by being a businessman. That is who his supporters voted for. They voted for him based on the family relationships he had with his adult children. They saw his -- while he was campaigning, they saw Donald Jr. and they saw Eric and they saw Ivanka as fundamental parts of who Donald Trump is. And so the pushback that we are getting from the Trump world is this is who I am and this is what I'm going to be doing as president of the United States and so live with it. REHMDarren Samuelsohn, senior policy reporter for Politico. Short break here. We'll be right back. REHMAnd welcome back. Here in the studio with me, James Thurber, he's professor and director of the Center for Congressional and Presidential Studies at American University, Darren Samuelsohn senior policy reporter for Politico, and by phone from Santa Monica, Richard Painter, professor of law at the University of Minnesota, chief White House ethics lawyer under George W. Bush. He's joining the board of Citizens for Responsibility and Ethics in Washington in January. REHMRichard Painter, tell us what that board is designed to do. PAINTERWell, the Citizens for Responsibility and Ethics in Washington is a reform group that has looked at conflicts of interest in government for quite some time, people moving in and out of government, the private sector and financial conflicts of interest of people inside the government due to their financial holdings and a wide range of problems. So I'm hoping that the group will continue to monitor both Congress and the White House for conflicts of interest so that the public can be aware of what's going on. PAINTERIt's critically important, along with the other problems in government. I'm also on the board of a group called Take Back Our Republic that focuses on campaign finance as a serious impediment to government ethics and the corruption of campaign money. So these groups are there to inform the public about what's going on so we can hopefully move toward a more transparent and conflict-free government. 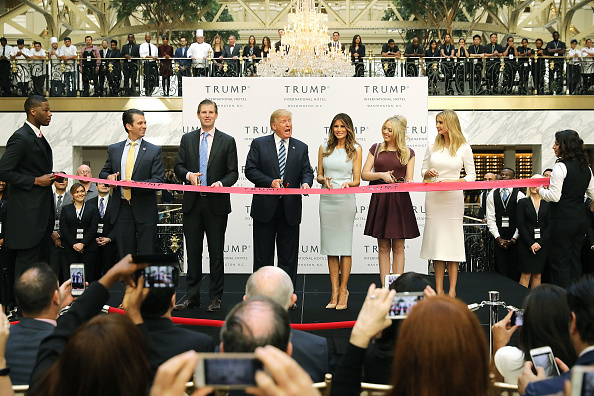 REHMAll right, and Jim Thurber, is the president, or the president-elect in this case, exempt from laws regarding financial conflicts of interest? THURBERWell he says he is. He tweeted, he said the law is totally on my side, the president can't have a conflict of interest. Mr. Painter can help us on this, but I think he is not exempt. Certainly the actual and perceived conflict of interest undermines his capacity to represent the American people generally. Now there's one provision, by the way, in the Constitution that says that if the only explicit congressional consent validates exchanges from foreign nations. THURBERAnd so if they make an explicit decision to allow him to have all of these, that's okay. I don't think they will. Or specific ones, that's okay. I don't think they will. PAINTERWell the president can have conflicts of interest. The one statute that President-elect Trump is referring to is a criminal conflict of interest statute. That does not apply to the president. But the Emoluments Clause of the Constitution does apply. That's a provision that says no foreign government money. There's another domestic emoluments clause that refers to money coming from the various states. So we have to look at the tax breaks there. PAINTERThere's a potential for bribery and gratuity investigations when people mix Trump business with official United States government business. We can't have diplomats calling on official business, and people are asking, well, what about the ugly windmills near the Trump golf courses. Those types of conversations, mixing Trump business and U.S. government business, cannot occur. So there's a lot of law that applies to the president. The president is not above the law, and I think that President Trump will hopefully do everything he can to avoid not only violations of the law but the appearances of violations. PAINTERAnd I hope he can say more about what he's going to do in the very near future. SAMUELSOHNWell he's also got financial disclosure requirements, as well, that are law. So there's about, I think, eight or nine parts of federal code that do apply to him. So as the ones that Richard just pointed out, anti-bribery requirements, anti-nepotism requirements. He's going to have to kick out information about what his business holdings look like every year. SAMUELSOHNThe document that we do have right now that we've been relying on that every report has been combing through is a financial disclosure form he had to file as a presidential candidate. And that doesn't give us a lot of information, but it did tell us where his stock holdings were, it did tell us about these 120 companies in I think it's 18 to 20 countries that he is operating in. So when we get to see that again, I don't think we're going to get to see that for several more months, if not another year from now, but we'll be watching closely for that. SAMUELSOHNObviously if he did release his tax returns or some other documents, we might get a little bit more of a sense. Another big question is when he does do this press conference, what kind of paper will they provide to the press, to the public, to assure us that he's doing what he says he's doing. REHMWill he be required to release his tax returns? SAMUELSOHNI don't think he'll be required to release his tax returns, no. REHMEven as president of the United States? THURBERWell we have a separation of powers. If Congress, and I doubt that they'll do it because we have unified party government, the same party in the House and the Senate, if Congress passed a law, and he vetoed it, and they overrode the veto to require him to do it, then he would have to. He doesn't now. I would like to know about his lawsuits, also, with Trump University but also he's suing the District of Columbia to not pay taxes on the Trump hotel. It's outrageous in my opinion. THURBERI don't know, but I saw it reported, you know, more than one source, Politico. SAMUELSOHNHe lost -- he lost an earlier case on this front where he was questioning the tax assessment that was put by the D.C. government on the hotel that's a couple blocks from the White House. SAMUELSOHNI believe it was the amount that he was challenging. He lost once, and I believe he just refiled this lawsuit since winning the election. So there are a lot of lawsuits that he's been trying to wind down, including the Trump University lawsuit, but there are scores around the country, in state courts. There are cases, there's a case down in Florida involving -- he's in a fight with the members of the Jupiter Trump National Golf Club over I believe some trees that were cut down. This is a case that's in federal court. That will continue going. SAMUELSOHNHe's also suing -- and this case is still going on, the chefs who were going to build restaurants in Donald Trump's hotel. There is a suit and a countersuit that continues to go forward, and there's a question Donald Trump is likely to face another deposition as a president-elect, if not president, where he's going to have answer questions under oath. We saw on one of the earlier cases, the videotape was actually released after the news media sued to get it released, and we did get to see Donald Trump engaging, I believe this was just a couple of weeks before the election. SAMUELSOHNBut he's going to be put under oath, on camera, which we know from the Paula Jones, Bill Clinton precedent, you can do with a sitting president of the United States. So this is a very risky and potentially very embarrassing political problem, not so much may be legal for Donald Trump, but to have these lawsuits coming out, you know, the direction that these things can go, you know, just think about the Paula Jones case. It can go in a lot of different directions. SAMUELSOHNSo Donald Trump and his political advisors, as they are thinking through this right now, they need to be clear that, you know, scandal and politics is going to shadow him for the next four years. This is a big issue potentially for him in the 2018 midterm elections and certainly as people think about challenging him in 2020. Do -- is this the issue? I someone who tried to drain the swamp also lining his pockets? This is something you hear over and over from Democrats and from a couple of Republicans who are starting to worry about how this politically will play over the next four years. SAMUELSOHNI know we don't want to think about presidential elections or even midterm elections right now, but they will be coming soon enough. REHMAll right, and to you, Richard Painter, this question of nepotism, a tweet from Joshua, who says just out of curiosity, how did that work with Bobby Kennedy as attorney general? PAINTERWell the Congress enacted the statute, the anti-nepotism statute, after the Kennedy appointment. And that was one of the reasons, but you also had members of Congress who had their spouses and other family members on the payroll in their offices. There was even nepotism over at the post office. So Congress changed the rules. So for better or for worse, I think that we might actually have fewer scandals in government if you had some of the spouses in the -- working right there in the West Wing for the president and the congressional offices. PAINTERBut they changed the rules. So I think the anti-nepotism does cover the executive branch, all of the executive branch, including the White House staff. When Hillary Clinton's health care task force was reviewed by the District of Columbia Circuit Court of Appeals, the -- two judges expressed some doubt as to whether the statute covers the White House staff. One judge felt very strongly it did cover the White House staff. They decided the case for other reasons, that Hillary Clinton, the first lady, already had an office over there in the White House, could head up that task force. PAINTERI think that the statute probably would prohibit President Trump from appointing his daughter Ivanka or her husband Jared to positions in the White House staff, but there's room for disagreement on that, and if he wants to go ahead and take that risk and appoint them, take the risk that a court is going to disagree and require them to resign, then I guess he can -- he can go ahead and do that. PAINTERThe worst thing for him to do, though, would be to have them not be government employees, not be subject to the financial conflict of interest rules and the disclosure rules and yet running around the West Wing, influencing policy and then going back to the residence or the first lady's office as a base of operations. I think that would be disingenuous and create a lot of problems. PAINTERSo if he's going to do it, I think he ought to just go ahead and do it as a regular White House appointment and then see what a court says. REHMAll right, and joining us now by phone is Newt Gingrich, former speaker of the House, Republican congressman from Georgia. Thanks for being with us, Mr. Speaker. MR. NEWT GINGRICHIt's good to be with you, and I wish you a Merry Christmas as we approach the season here this week. REHMThank you. You've said we shouldn't be surprised about the possible conflicts of interest we're discussing here today. How come? GINGRICHWell I think for two very different reasons. First, you have somebody who is a billionaire, and we have not really dealt with this relative scale of wealth in the White House in some ways since George Washington, who may have been the wealthiest man in the colonies. So historically this is an unusual amount of economic interest and virtually impossible to isolate. GINGRICHI mean, you can't say that Trump Tower is not the Trump Tower or the Trump hotel is not the Trump hotel, and you can't say that the kids who run it aren't his children. So you go through all -- you can do contortions, but the fact is these are facts, and they're obvious. Second, the -- it's interesting story. The whole anti-nepotism thing is Lyndon Johnson's reaction to Bobby Kennedy and the fact that Johnson Kennedy, and Kennedy had been attorney general under his brother and that it was a very narrowly focused bill really in reaction to a particular personality thing. GINGRICHPrior to I think it was 1964 or '4, prior to that no one ever worried about it. I mean, it wasn't something which came up. And so I think that it's -- you have to look at it in the context of what they were trying to accomplish. I think in the case of the president, he has a broad ability to organize the White House the way he wants to. He also has, frankly, the power of the pardon. I mean, it is a totally open power, and he could simply say look, I want them to be my advisors, I pardon them if anybody finds them to have behaved against the rules, period. And technically under the Constitution he has that level of authority. REHMAnd you're listening to the Diane Rehm Show. That level of authority strikes me as rather broad and perhaps ought to be in the hands of the Congress rather than within his own hands, Mr. Speaker. GINGRICHWell the -- I mean, the founding fathers deliberately granted the president unequivocal ability to pardon, and they did so in reaction to the British use of going back after people legally and persecuting them by changing the law after they had done something. So there was a very deep sense that you had to fear government and that government could be the enemy, and the founding fathers were walking this tightrope. GINGRICHThey wanted a government strong enough that it could defend America against foreigners, but they wanted a government controlled enough that it wouldn't threaten Americans, and that's part of what this balance of power is. And if you read the Federalist Papers, they were quite what they were doing and why they were doing it. REHMOn the campaign trail, did you talk with voters about this? I mean, did they simply say whatever his financial arrangements are is fine with me? GINGRICHWell I think it was -- I didn't walk around and ask them about it, but I think it was pretty clear that he was a billionaire. I mean, he said it all the time, his opponents said it all the time. And I think that there was a general sense that the president, you know, had the ability -- that this was going to be a billionaire presidency. I mean, it's not -- I don't think anybody who voted for him was not aware that he was a very, very successful businessman. REHMOn the other hand, is there any role for the Congress to play here? GINGRICHWell sure. I mean, I think first of all the Congress always can hold hearings and can examine any kind of, you know, any kind of conflict of interest. I think second, the Congress can try to figure out how do you do this. My point is we have never seen this kind of wealth in the White House, and so traditional rules don't work, and we're going to have to think up, you know, a whole new approach. GINGRICHI've suggested that people who are widely respected, like Attorney General Mukasey, might -- that the president-elect might want to form a panel who are sort of a review group, if that makes sense, and that the panel would monitor regularly what was going on and would offer warnings if they get too close to the edge. I think it's a -- you know, it's a very real problem. I don't think this is something minor. And I think certainly in an age when people are convinced that government corruption is widespread both in the United States and around the world, you can't just shrug and walk off from it. It's an issue that we have to think through, and we have to find a solution for. REHMWhat about the Emoluments Clause and all these business interests that Mr. Trump has around the world? GINGRICHWell, the Emoluments Clause is a very real concern. What it would suggest is that the president could not take any kind of -- although it says they can take things with the specific, explicit approval of the Congress. That's the only circumstance under which they can be involved in accepting things from foreigners. And of course it was designed to avoid the very real danger of foreign governments trying to bribe Americans. So I think it's a very real challenge. REHMSo it sounds as though, Mr. Speaker, you are saying the Congress is going to have a very busy time in the next few months. GINGRICHOh absolutely, and I think they should. I mean, look, I think that legitimately we have to -- we have to wrestle with this question that we've never had anybody quite like this. REHMI'm afraid we're out of time. I want to thank you, Newt Gingrich. REHMFormer speaker of the House, Republican congressman from Georgia. Thanks for joining us. REHMAnd welcome back. You've just heard from former Speaker of the House, Newt Gingrich. I wonder, Jim Thurber, your reactions to what he had to say. THURBERWell, Speaker Gingrich's statement that wealth trumps the rule of law -- basically, that's what he was saying -- is jaw-dropping. I can't believe it. He's a historian. He should also know that we did not want to have a king. And a king, in this case, is somebody with a lot of money that cannot abide by the rule of law. You know, Newt Gingrich, in 1995, when he took over the House of Representatives, he was Speaker, he pushed through many provision that if they were applied to this president I'm not sure he could take office. The anti-nepotism rule, lots of conflict of interests, definitions, it was quite something in 1995. And I think he's forgotten about that. REHMRichard Painter, I know you dropped off the phone for a while. Were you able to hear Speaker Gingrich? PAINTEROh, I just dropped off for a minute after he went off, so I heard everything he said. There is no billionaire exception in the Constitution of the United States. And I would also add that while I think George Washington was a great president in many ways, the financial conflict of interest that he and President Jefferson, our third president, had with the plantations and the slave labor turned out to be one of the most tragic in our nation's history. So that part of his -- of their precedent I don't think is a good one to point to. PAINTERFinally, the pardon power cannot be used by the president to pardon himself or to cause other members of his administration to engage in an illegal conduct, unconstitutional conduct and then simply use the pardon power in that way. If the pardon power allows that, the pardon power allows the president to become a dictator. And even Richard Nixon had the decency to wait for his successor to hand out the pardon that he received for his illegal conduct. So we are going down a very, very treacherous path if we go where Speaker Gingrich is saying, he is suggesting. REHMAll right. I'm going to open the phones now. First to Ben, in Ellicott City, Md. You're on the air. BENYes. Thank you for taking my call, Diane. BENI have concerns about -- for this president and the United States, how is President-elect Trump gonna react if terrorists or whatever attacked his assets, they're unprotected around the world? And I would think if I'm a terrorist and I want to send America a message, I go to his assets around the world and I attack them. REHMWhat do you think, Darren? What obligation does the U.S. government has to protect the assets of a sitting president? REHMNot to mention the disruption to that city. SAMUELSOHNThe mayor has talked extensively about how much money he's had to spend and looking for federal funding to help back up the police units that have had to be out there in front of Trump Tower. But obviously, the buildings that he's not in, but nonetheless are his properties or his name, whether it be in a peaceful location, whether it be Ireland or Scotland or whether be in the Philippines, which is obviously in a very difficult, challenging place right now in the world as well, it is a very large question. SAMUELSOHNWho will pay for this security? And should these names -- should the Trump name even be on these buildings going forward? There was an announcement right before the election that a lot of people responded to, where the Trump organization changed the name for new buildings going forward. They're gonna call it the Scion Family, for sort of a young up and comers to try and make it sort of a millennial, hip new hotels. SAMUELSOHNHowever, as we know Donald Trump just a couple of days ago did announce on Twitter, where he's now apt to break his news, that there aren't gonna be new deals going forward. So I don't know that we're gonna see any new Donald Trump construction projects over the next four or eight years, as long as he's president of the United States. But everything that exists, big questions. And right now, you know, you can look on Trump org, the Twitter handle or go to the Trump website and you can see, you know, advertisements for all of these buildings and hotels and condos and, yeah, the President's name is still on them. THURBERThe bottom line, to answer his question in one sentence, is we don't know. We don't know what the President will do. We don't know whether he'll be sitting in the situation room with his generals, figuring out whether they should send troops out to protect a building or not, even though he doesn't really have his name on it anymore. We don't know. It's a big question mark. REHMAll right. To Jim in Brick Township, N.J. You're on the air. JIMI think you're just hitting your stride. We need a strong voice and a consistent one. I hope you stay in the game 'cause it's needed now. I was surprised to hear Gingrich talk about Washington in regarding nepotism. I heard that they selected Washington because he had no children and there wouldn't be any hereditary issues with him being seated anyway. But I was calling about some sort of resolution, also the flip side of the pardon that the 25th Amendment empowers the vice president to make a case and with the consent of the House, if there's deemed to be an incapacity with the president. JIMI was wondering if that were a resolution with -- 'cause it's the Second Amendment -- this is already very -- looking very sinister. The -- I think the First Article, not amendment rather, deals with domestic emoluments, which then Trump has actually stated that he's not subject to once he is president, but it's the foreign holdings, Article 2 that deals with the foreign emoluments and almost every day there'd be a conflict where as soon as anyone checks into one of the hotels, if they're dealing -- trying to develop the hotel in Mumbai. I mean, it's just bizarre that Gingrich would say he welcomes Congress scrutiny. They'd have to get the guest list every day. REHMRichard Painter, do you want to comment? PAINTERHe can't receive foreign government money. He is going to have to get rid of the hotels where foreign diplomats are staying at government expense or he's gonna have to find someone else to receive those payments. He cannot, under the Constitution. And his buildings around the world, he needs to get his name off these buildings, whether it's a terrorist risk, he shouldn't be owning buildings in countries where there is instability. And imagine where we'd be if President Roosevelt had owned big towers in Frankfurt and Berlin. REHMAll right. I want to interrupt here to say that the BBC is reporting that the Russian ambassador to Ankara, Turkey, Andrey Karlov, has been shot, seriously injured, while visiting a photo gallery in the Turkish capital. Several other people reportedly injured in the attack, a day after protests in Turkey over Russia's military intervention in Syria, according to the BBC. There is never an end to the violence that this world is suffering, Jim. THURBERYou know, Claudia and I, my wife and I were in Istanbul and missed a bomb by 30 minutes when I was giving lectures there about the election. And so I came home. And then on the way home we were going through Brussels and there was a bombing just before we got to Brussels. So we, you know, it's pretty close. REHMA number of people have been saying that the Trump children, especially Ivanka, have already sat in on meetings and especially we know with the Japanese ambassador, who was here in Washington. What is all this leading to? How can the American people be assured that even if they're simply advisors that there is not this return of information on businesses within those particular countries? SAMUELSOHNIt is a great question. We just reported a story on Friday in Politico, Friday evening, that Donald Trump, according to his spokeswoman, did indicate to us that he is willing to put some constraints, once he's president, on his conversations with his children, with his adult sons. We will see exactly how detailed that is. We had been hearing that he was opposed to any kind of restrictions, that what his close business associates were telling us. SAMUELSOHNWe brought that actually to the Trump transition and asked them to comment on it. And they pushed back and offered the complete counter argument and said no, actually President-elect Trump is willing to accept some sort of constraints on the children. Exactly what that means and in what context, we will be quickly hoping to find out. We also asked and were told by the Trump transition that he does not want briefings. Or he doesn't expect occasional briefings on the Trump Organization as president of the United States. THURBERWait a minute. Maybe he's getting the briefings on "Morning Joe," that's where he says he likes to the briefings. Maybe they should start briefing him on conflict of interests. REHMAnd, Richard Painter, who is going to oversee the President himself? PAINTERWell, I think he's gonna have to have lawyers in the White House or -- giving him good advice and he follows it. Because the Constitution has made it clear that the House of Representatives does have the power to impeach. We do not want to go there. But this is a very difficult situation. We just heard about Turkey and we've had a number of altercations between Russian and Turkey. What where one started over an assassination, we could have a crisis over there. PAINTERAnd the last thing we need is to have the president of the United States have business properties that he wants to protect in Turkey. And what's gonna happen? Does he tell Putin, well, you can have the rest of Turkey, so long as you let my buildings alone? I mean, we do not want to be in that situation. So there are real consequences to these conflicts of interest, particularly when they're global and the volatile environment we have today around the world. PAINTERAnd he needs to divest of these holdings that are creating some of the most serious conflicts of interests, so he can make very, very difficult decisions in what could be very dangerous situations. So I'm hoping he's gonna start thinking about taking this job seriously. He wanted the job, and now he needs to free himself of the conflicts of interests. These are not minor conflicts. These are not inconsequential conflicts and they're serious. PAINTERAnd once again, I want to emphasize this notion that he could pardon himself or pardon other people in his administration out of unconstitutional illegal conduct, if there's even a whiff of Speaker Gingrich's advice being taken by this administration I would recommend that impeachment proceedings begin immediately. That is unacceptable, what the Speaker said a few moments ago. REHMAnd of course, you've got people he's already named to his cabinet, like Rex Tillerson, who has a good working relationship with Mr. Putin. SAMUELSOHNWhich is why Donald Trump presumably picked him, among other reasons, as well as his, you know, executive experience, running one of the largest corporations in the world. No doubt when he is before the Senate Foreign Relations Committee and is getting grilled by Democrats and Republicans, the conflicts that he brings to the table and the conflicts that President-elect Trump brings to the table will be discussed. And not just in the Tillerson nomination, but all the other nominations, as well. These are gonna be serious issues. REHMAnd you're listening to "The Diane Rehm Show." And to Bob in Portland, Ore., you're on the air. BOBOh, hey, Diane. Thanks for taking my call. BOBI love your show. I've been a fan for years. BOBListen, this is just the beginning of a trail of huge tears for the American public. This is not a president. This is a king. This is a dictator. He has bought his way into the presidency. It's no secret. The conflict of interest with his business ownings and his -- not turning over his tax returns and sexism, racism, dismissing people left and right, lawsuits, what is it going to take for the American people to wake up, impeach this man. REHMI think that's a bit premature. THURBERIt's premature, but let's remember the voters were angry. The voters thought there was a conflict of interest. They thought that Washington was run by elites, that money really was the most important thing. And you go overseas, one of the first questions you get is, isn't American politics all about money. This reinforces that. It undermines us internationally, it undermines our trust in government now. THURBERHe has to make the decision about whether he's representing the American people as president or whether he's gonna maintain ownership of the Trump Organization. He has to sever it or he will continue to have a problem with the American people and continue to have a problem with voters in 2018 and '20. REHMI gather, Jim, that Trump has his transition team sign a code of ethics. What did it say? THURBERWell, it said that you couldn't reveal anything that they were considering. And they couldn't leave and become lobbyists immediately. By the way, he's proposed, but we haven't seen much about it, a five-year cooling off period after you leave the federal government. It's now a two-year cooling off period. But there's all kinds of ways around that -- before you become a lobbyist. So it was a way to keep the Trump transition team quiet about what was going on, more than anything else, in my opinion. REHMSo where's your reporting going to go on this, Darren? SAMUELSOHNWell, we've got a couple more weeks until Donald Trump presumably rolls things out. Whether it actually is a press conference or not I guess we'll find out. We didn't really get specifics, except to know that it was gonna be before the inauguration, is when he was going to roll out the details here. Congress is certainly -- as Speaker Gingrich even acknowledged it -- this is going to be a huge issue for Congress going forward. SAMUELSOHNAnd you've seen Democrats making a lot of noise, introducing bills, resolutions. They're in the minority, so they can't really cause, you know, the changes necessarily from where they sit. But watching the Republicans and watching where Speaker Paul Ryan goes and where Senate Majority Leader Mitch McConnell go on this is gonna be huge. And right now they're not -- they're accepting where Donald Trump is on (unintelligible). REHMDo you believe that a majority of the Congress would -- or a majority of Republicans would go along with what Speaker Gingrich said about Trump's ability to pardon himself? SAMUELSOHNThat is a billion-dollar question that will be answered over the course of the coming months. Remember, Trump, you know, won the presidency with a smaller sub-set of Republican support in Congress. A lot of Republicans supported Ted Cruz or Marco Rubio or Jeb Bush. And really came along toward the end, once he won the presidency, I mean, even look at the way Paul Ryan played footsie with Donald Trump throughout the campaign. SAMUELSOHNSo I think if leadership were to signal that they're not comfortable with this, if they're getting questions on the campaign trail or back home, it would put them in an uncomfortable spot. And the Democrats would have been making noise about this. Might ultimately push the Republicans to at least hold hearings and talk about this issue in a more public way. REHMDarren Samuelsohn, senior policy reporter for Politico. Jim Thurber, professor at American University. Richard Painter, professor of law at the University of Minnesota. Thank you all so much. THURBERThank you for having us. REHMThank you. And thanks, all, for listening. I'm Diane Rehm.